With each passing day in 1996 it became more likely that South Texas was in the process of defining a new “drought of record” – an historic benchmark in a forever altered reality for the Coastal Bend area of South Texas. More than 400,000 people including those served by the San Patricio Municipal Water District were solely dependent on the water in storage in Lake Corpus Christi and Choke Canyon Reservoir. Nueces River Basin stream flows into those two reservoirs from 1993 to 1996 were the lowest on record – even lower than the much-remembered 1950s Drought. As storage levels slipped to 25% of capacity, the decision was made to take action. The San Patricio Municipal Water District was an active participant in the Regional Water Supply Task Force which determined that the region was in a crisis – that the 20 communities served by the Lake Corpus Christi/Choke Canyon system could be essentially without water in 18 to 24 months. Not since the 1950s had a major Texas city faced as serious a water shortage as Corpus Christi did in mid-1996. The Task Force was charged with searching out ways to deal quickly with this impending water supply emergency. They determined that the only option available that could be completed in time was to deliver water via a new pipeline from Lake Texana. It was needed to save jobs and avert wrenching economic disruptions that might scar the region for decades to come. 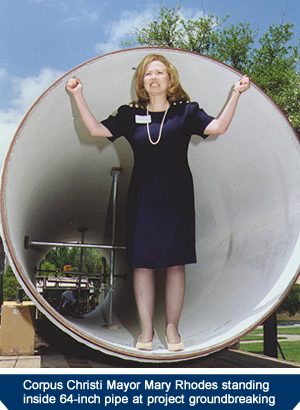 The pipeline is named for the late Mary Rhodes, mayor of Corpus Christi from 1991 to 1997, in recognition of her special contribution to development of water resources for the residents and industries of the Coastal Bend. The Coastal Bend region is an area with very limited groundwater supplies. The goal of the Mary Rhodes Pipeline Project was to be able to continue to provide dependable and affordable water to residential and industrial customers in the area without the kind of supply interruption the 1996 Drought made clear was possible. The further goal of the project was to capitalize on the bold action of previous area leaders who in 1994 contracted to purchase nearly half the annual yield from Lake Texana. Finally, water supply planners set out to make the pipeline system large enough to later transport other water in addition to the 41,840 acre-feet that could be taken annually from Lake Texana. The region had optioned rights to 35,000 acre-feet annually of water from the Colorado River which were purchased in 1999 after state approval of the interbasin transfer. The concept of the Mary Rhodes Pipeline did not originate in crisis. The Drought of 1996, however, was a crisis and it forced the community to build the pipeline 10 years earlier than had been anticipated. Planning for new water supplies for the Coastal Bend started in the early 1980s, soon after completion of the Choke Canyon Dam upstream from Three Rivers on the Frio River. Over time it became clear that another reservoir in the Nueces Basin would not produce significant additional yield. This was particularly true in light of the commitments made to freshwater inflows to the downstream estuary system. 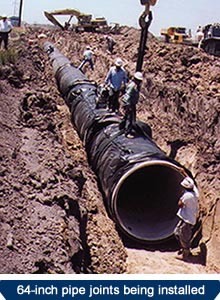 Plans for the pipeline project grew slowly out of a series of water supply planning initiatives including a mayor’s task force, a search for water supply options done in cooperation with the City of San Antonio, and finally, the Trans-Texas Water Program which was completed in 1995. The final Trans-Texas Phase II Report identified the pipeline from Lake Texana as the most affordable large-scale water supply option available to the region. Trans-Texas included substantial preliminary work on pipeline environmental issues, routing, design constraints, costing and water quality issues. By the early spring of 1996 the water providers in the regional system were forced to begin implementing drought contingency plans. By May it was necessary to initiate restrictions on all outdoor water uses. A pivotal point in making the decision whether to go forward with the pipeline on a fast-track basis came during a congressional subcommittee hearing in Corpus Christi in July 1996. During that hearing the City introduced what quickly became known as the Doomsday Chart showing the reservoir levels dramatically declining over the last three years. 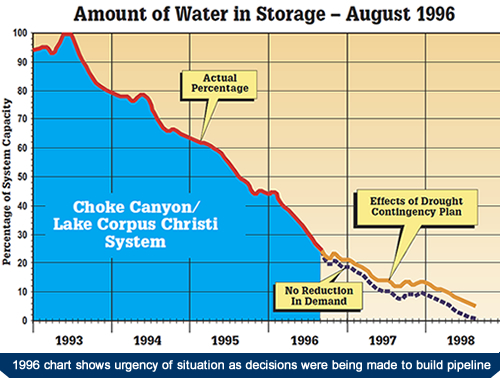 But most impressively, it illustrated that, based on a repeat of conditions in the previous drought of record, there was the possibility of the Choke Canyon/Lake Corpus Christi reservoir system running dry in less than two years even with full drought management measures in effect. During that same public hearing a representative of the Texas Water Development Board was asked how much help the state could give the region if the Nueces River system ran dry. His reply was that the sum total of the state’s ability to transfer water was five tanker trucks. The Mary Rhodes Memorial Pipeline, built under budget at a cost of $127 million, delivers water 101 miles from Lake Texana near Edna to Corpus Christi. All but a small portion of the pipeline is 64-inch diameter reinforced concrete steel cylinder pipe. 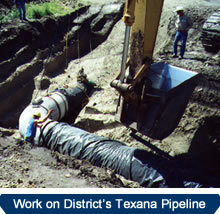 There are more than 15,000 joints of pipe along the route which runs through parts of five Texas coastal counties. There were seven open cut river crossings and two directional drilled crossings including one that set a new world record for diameter and distance. The work was done under a total of eight different construction contracts. At one time three different installation crews were working simultaneously on different pipeline segments and laid as much as 1,500 feet of pipe in a single day. Right-of-way was a major issue early in the process. The route crosses some of the biggest ranches in Texas and owners were reluctant to be the first to agree on a price. The project employed more than a dozen landmen working out of right-of-way offices in Corpus Christi and Victoria. The pipeline project today benefits all of those who depend on the water supply system managed by the City of Corpus Christi. This includes residents, businesses and industries in seven counties including Nueces, San Patricio, Kleberg, Aransas, Bee, Live Oak and Jim Wells. The pipeline helps maintain economic stability in the region and benefits virtually every economic stakeholder in the area. As the Mary Rhodes Pipeline was being built in 1997 and 1998, the San Patricio Municipal Water District was working to add this new source to its water inventory. In 2000 it completed the District's own Texana Line which connect to the Mary Rhodes line south of Sinton and carries water to the District treatment complex. The first 13 miles of the pipeline is 36-inch diameter concrete steel cylinder pipe. At that point water from the Nueces River line is blended in and the pipeline size increases to 42 inches in diameter for the remaining 7 miles. In 2006 this pipeline was named in honor of the late Gene Dressen who served on the Water District Board of Directors for 36 years. Dressen retired in 1990 from his position as plant manager for the Reynolds Metals Sherwin Plant (now Sherwin Alumina) where he had worked since 1952. A project of the magnitude of the Mary Rhodes Pipeline could be expected to typically take five to eight years to plan and build. To get it done in the shortest possible time a special joint effort was organized by the City of Corpus Christi, the Nueces River Authority (NRA), the Port of Corpus Christi Authority and the Lavaca-Navidad River Authority (LNRA) in cooperation with wholesale water customers. The Nueces River Authority issued the revenue bonds to fund the project and awarded the construction contracts. The Port Authority, which has long been an active participant in regional water supply planning, took on the role of project manager for planning, engineering and construction of all project components except the primary pump station and the Lake Texana intake structures which were handled by the LNRA. The project was done in record time and under budget. As much as five years was cut off the project completion time by implementing an emergency fast-track schedule. It was necessary to do as many things as possible simultaneously to get the job done before the deadline. That meant that contracts for pipe, pumps and construction were awarded before design was complete, right-of-way was acquired or permits were in hand. Some cost savings were achieved from the speed and from the fact that the project components went to bid at a very opportune time when there were few competing projects. The City also elected to seek bids on several pipe diameters and multiple pipe materials as a way of maximizing the capacity of what could be built with available funds. The result was that pipe manufacturers were highly competitive as were the firms bidding on pipe and pump station installation. An important factor was that the Trans-Texas planning studies had been completed just a year before. That provided the City with excellent preliminary cost estimates that were used to prepare for the bond sale for the project. That meant that even though right-of-way was not acquired and design was not complete when bonds were sold, the $132 million budget was adequate to get the job done. The fact that additional funds were not needed to finish the project was important in the fast-track project. An endangered species, the Attwater’s Prairie Chicken, also had something to say about the pipeline construction schedule. Work could be done in its habitat in northern Refugio County only outside of its mating season, creating a construction window from July 1 to Dec. 31. Complying with that limitation required that special equipment be used to ensure work was completed before the deadline. While the project was being rushed because of the lack of rain in the Nueces River Basin, work was slowed at the north end of the project by continuing heavy rainfall and wet conditions. 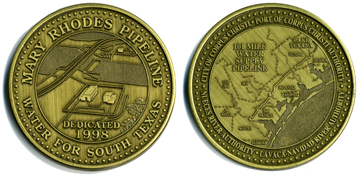 Completion of the Mary Rhodes Pipeline in 1998 and the availability of water from Lake Texana created substantially more flexibility in management of the region’s water supply and provided a firmer foundation for a sustainable economy. The pipeline provides a means of conveyance for additional water that will be needed as the population of the Coastal Bend grows. While customers of the regional system are among the best in Texas at conserving water, the pipeline has meant they face fewer periods of water use restriction. That is a major plus for both economic stability and personal comfort and convenience. Mayor	Rhodes	died	of cancer in	1997	at the age of 49. The Mary Rhodes Memorial Pipeline was dedicated on Sept. 29, 1998.